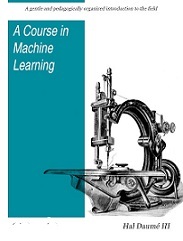 This is a set of introductory materials that covers most major aspects of modern machine learning (supervised learning, unsupervised learning, large margin methods, probabilistic modeling, learning theory, etc.). It's focus is on broad applications with a rigorous backbone. A subset can be used for an undergraduate course; a graduate course could probably cover the entire material and then some. Hal Daume III is an associate professor in Computer Science and Language Science at University of Maryland.